Sure, I ignored posting much of a self-congratulatory note on May 16th, the fourth anniversary of starting this blog — but if you’d just written 30 blog posts about 30 drinks in 30 days, wouldn’t you? But now that I can stand to see the inside of WordPress again, and before it completely fades from my memory, I should note that as of May 16 I’ve been running this little contraption for four circuits around the sun, thanks in small part to my stubborn nature but in much, much larger part to the kindness and patience of all the people who’ve stopped by to read, subscribe, comment or poke fun at me over those four years. A sincere thanks to you all, and I hope to meet many more of you in person in the year to come. Now that that’s out of the way, here’s the real business — Thursday morning (that’s tomorrow), at 10am, I’ll be a guest on Weekday, broadcast by Seattle’s NPR affiliate KUOW, where I’ll be joining host Steve Scher to talk about the humanitarian crisis in the Swat Valley, what Sonia Sotomayor could bring to the bench as a Supreme Court justice, and about North Korea’s nuclear test. Wait, sorry — I read the e-mail wrong; I’m actually there to talk about booze. What kind of booze? Local booze, summer booze, fun with booze — you know, the usual. 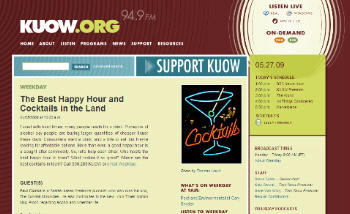 If you’re in the Seattle area, please tune in to KUOW 94.9FM at 10am; if you’re not local, or if you’re tethered to your computer and are radio-free, head over to the main Weekday page where you’ll be able to hear the broadcast live or download it to listen to at your leisure (note: that link is only valid for the day of broadcast, as you may have figured out if you visit it today and see a photo of Gary Snyder — I’m not quite that old or grizzled, yet; I’ll post a link afterwards for the show archives). And even better, you can join in: call-in numbers are 206-543-KUOW, or 800-289-KUOW. If you have no idea what I’m talking about, here’s a link to the show I did with Steve in January — it’ll sound something like that, except summery. ← 30/Mo…uh….wait, make that Mx30 … damn! Cool, congrats, Paul. Just passed my third anniversary.